Wow, sure are pricey pieces. David's bike is a Domi, no? His stock cables/Hyd lines/switch wires worked with these clip-ons? If your clip ons give you pain, Fred. Go for it. They look fantastic. Damn....I paid that much for Rizoma mirrors. At least those are something so much more substantial and worthwhile. Yeah, I'm seriously considering them. I bought Norman Hyde M bars for the 961 but learned they will raise the controls high enough that I will need replacement control wire/lines. The rise was about 2.5 inches over my stock clip-ons. Of course fitting the M bars means I have to buy a new upper triple clamp from Norton with bar clamps. - $$$$$$$$. Maybe these swan neck clip-ons will allow the use of the stock lines. I can vary the height of the adjustment to suit the wires/lines. I'd hate to spend around $300 on the clip-ons just to discover I still need new lines too. I'm thinking that if the stock lines worked on a Domi, then they should be good for my CR too. How much height did you gain ? Sorry , I need a side by side picture . Looks good.. The clipons offer 2 options. The difference is due to a longer vertical tube used on the touring version. Not bad 1.5" to 2.75" range. Sounds good. 70mm for me for sure ! Your 961 is the Sport version, correct? Your stock wires/cables/hyd lines should fit without problem. Is it just my impression or are your handle bar switch wires too short? They appear to be under some tension in your photo. Do you not have any play in the length of the wires to re-route them and adjust the tension? That's without a doubt . What I meant was If I was doing it I would go as high as I could take it 70mm . You've already seen my handlebar offset riser . The lowest I would ever go now is standard sport height and that seems low to me now. Great looking machine David ! I hope you get the chance to drive the hell out of it ! Maybe the switch clusters can be moved inward slightly ? Dunno, but looks like the switch wires will be the only issue. I wonder how much new switches with extended wires cost from Norton? I'd hate to have to slice into them and splice in extensions myself. Nigel, did the factory install new switches for your handle bar swap? Did they itemize the cost of the new ones on your invoice? I think FE said his wires didn't need changing. I thought I read somewhere that David said his wires were re routed and a bit tight? Did I dream this or is it in another thread?! Correct Tony, my wires were not changed. I do not know if this is because they are the same part numbers for CR and sport or simply because the boys managed to pull hard enough and stretch ‘em to get enough length!? But mine is a Commando, not a Domie. If I ever revert to clip ons on mine, it’ll be with the ABM ones. 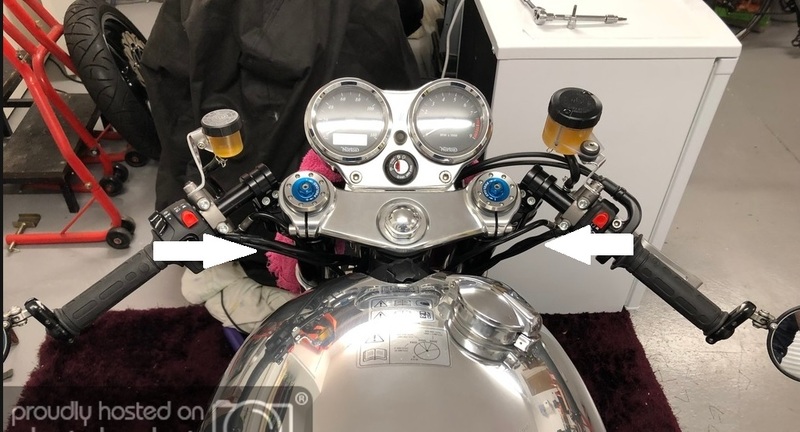 "Fitted a set of raised adjustable clip ons, only raised slightly but still needed to spin the brake and clutch cables to behind the forks to make it work"
Strange that your CR didn't need lengthened switch wires. But maybe the MK2 Commmado CRs are now given longer lines like Sports use - perhaps the factory now uses only one style of switches to reduce the need to stock multiple components. Longer hydraulic lines - I can fab, but longer switch lines will require new switches. As I said before, I'd hate to cut into the wires to add extensions. The switch cube wires are exactly the same on Sport, Cafe Racer and Dominator. The only bike that needs longer wiring on the switch cubes is the California. Correct, and new brake and clutch hoses. Wire harnesses not changed. But more to the point, have you ridden with the raised clip ons yet? I’m very keen to hear your thoughts on the riding position etc. You fitted raised clip ons but are still thinking about flat bars... I fitted flat bars, but am struggling with the aesthetics, so am still thinking about raised clip ons! TonyA and David Hales like this.